Take charge of slicing and dicing and learn the essentials from a Food Network pro. Kitchen Knife Skills is the foundation for any aspiring home cook. From tricky basics like cutting onions and tomatoes to the more complicated realm of poultry, seafood, and red meat, it's all here.36 Video Tutorials, Illustrated Step-by-StepsHow to Carve a TurkeyAvocadosPears and applesOranges, lemons, and limesPineapplePeaches, nectarines, and plumsArtichokeHot peppersCarrots, cucumbers, zucchiniTackle Tricky Food SituationsChop onions without the tearsSafely slice tomatoesQuickly mince garlicTake the intimidation out of cutting up a whole chicken or filleting a fishBuild Expert ConfidenceFeeling tentative with a sharp blade? 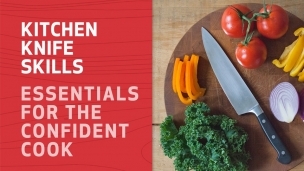 Learn how to hold the knife and prepare your food both safely and efficiently.About the Instructor: Sarah CopelandSarah is a New York City-based writer, food expert, and urban gardener, and her recipes and articles have appeared in Saveur, Food & Wine, and Real Simple. She was a long-time recipe developer for the Food Network and has published one cookbook, The Newlywed Cookbook, and has another to be published in 2013, Mostly Vegetarian.